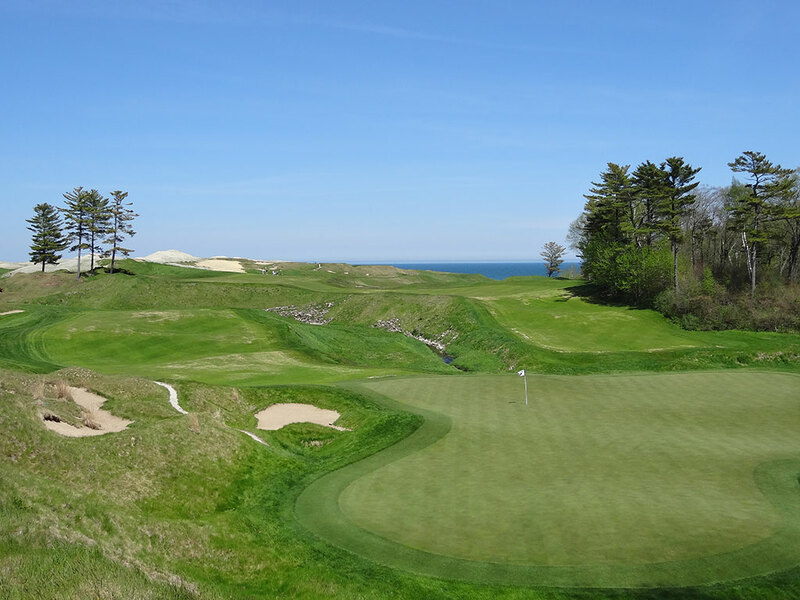 Course Website: Official Website - Visit Whistling Straits (Straits)'s official website by clicking on the link provided. Accolades: Ranked 1st in Wisconsin on Golf Course Gurus' Best in State list. 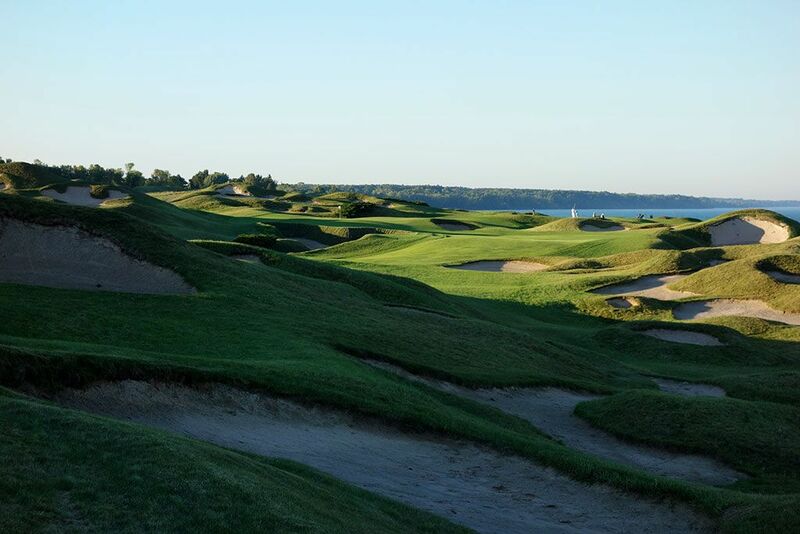 What to Expect: Whistling Straits has quickly become the most talked about course in the Midwest and started hosting major championships quicker than any course I can think of. 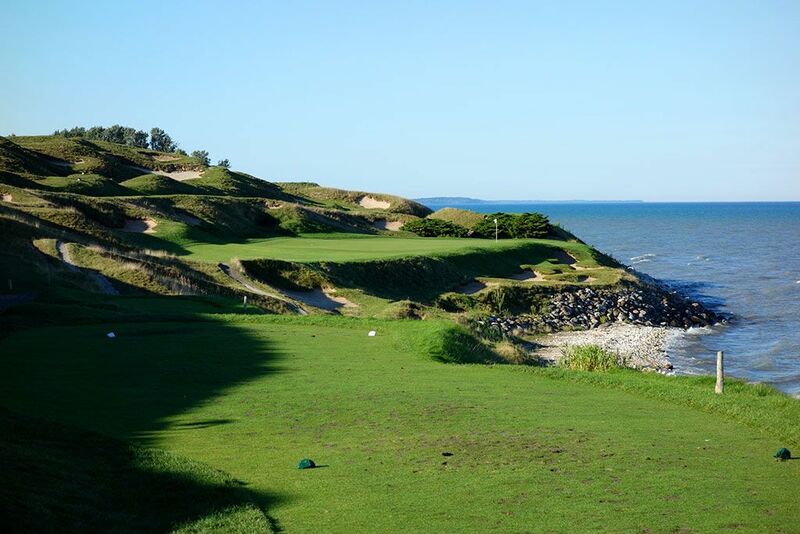 The Straits course enjoys a phenomenal setting next to Lake Michigan which gives the look and feel of an ocean-side links with views of the water from virtually every point on the course. 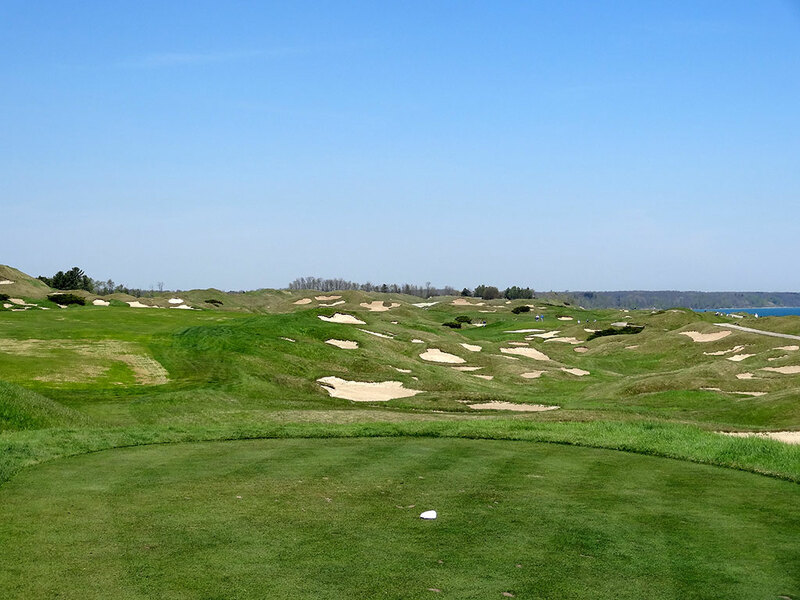 If you have an aversion to sand, then the Straits course will not be your friend. The layout features approximately 1,000 bunkers with the 8th hole hosting over 100 bunkers on its own. The fewest bunkers you will contend with on a given hole is 18, which is how many the 12th and 14th holes each have. You can bank on companionship from two things at the Straits course; a walking caddie (mandatory prior to twilight) and strong winds. The howling winds generally come from the south which makes the majority of the holes dead into the wind or dead downwind. 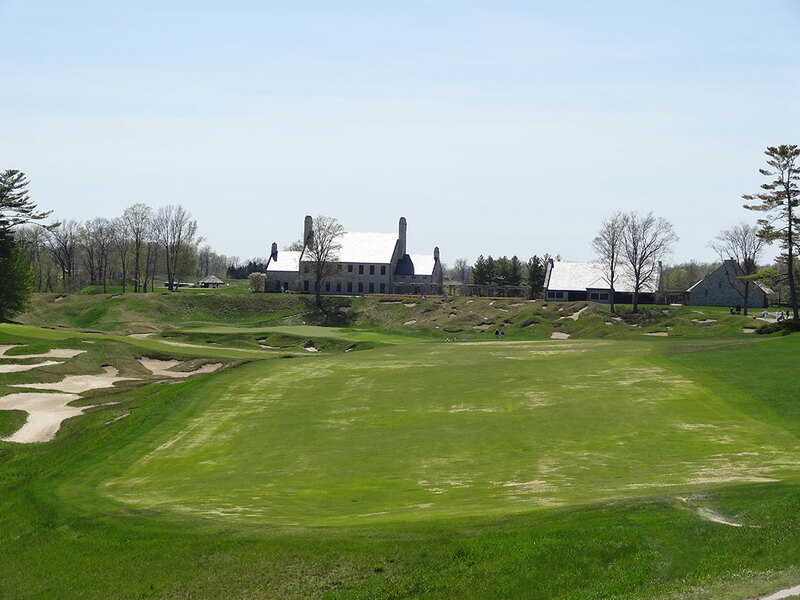 From the tips, Whistling Straits is one of the most difficult courses I've ever stepped on. 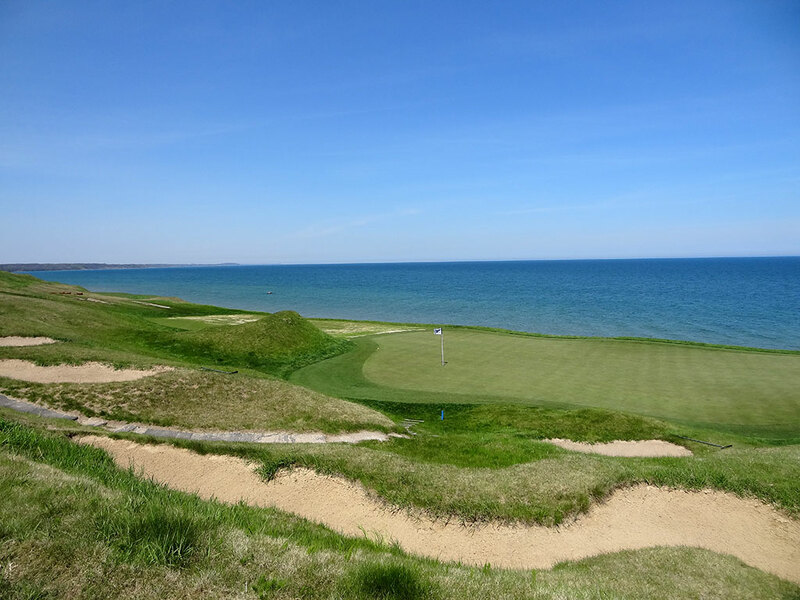 With strong winds, seemingly more sand than grass, plenty of length, and penalizing fescue lining the fairways, you better bring your 'A' game to contend with the mighty Straits. 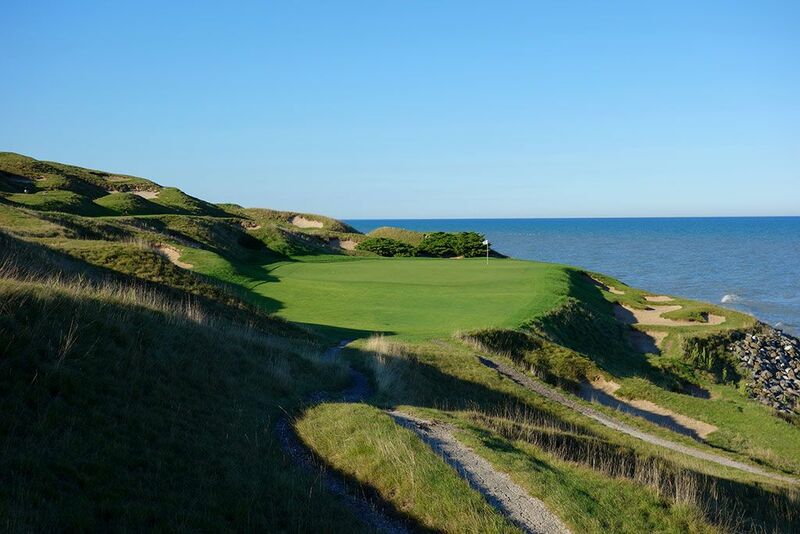 Signature Hole: 17th Hole – 249 Yard Par 3 – The collection of par 3s at Whistling Straits has few rivals in the country with the 17th standing as the most stunning of the group. 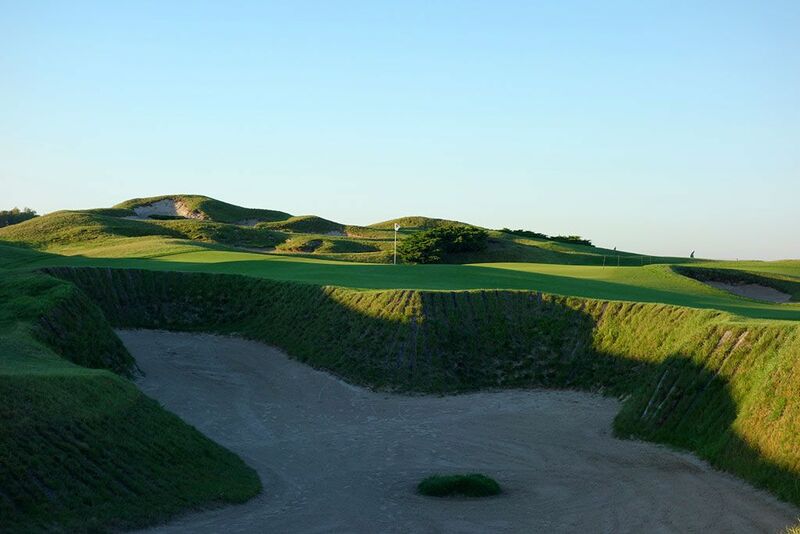 The hole plays from north to south down the coastline and features a sharp edge from the front of the green all the way down the left side which is supported by Dye's classic railroad ties. While the hole may be gorgeous, it can cause some serious damage to your scorecard; particularly if it is playing into the wind. A large mound with a bunker in the middle of it is found on the right side and can create a semi-blind shot into the hole. A large collection of bunkers sit below the green and to the left and create an incredibly difficult challenge when trying to save par from there. In August when the fescue is up and conditions are ideal, the 17th is one of the most impressive par 3s you'll ever come across. Best Par 3: 7th Hole – 221 Yards – Playing opposite of the 17th hole, the 7th runs from south to north and should give players a completely different wind direction to contend with. 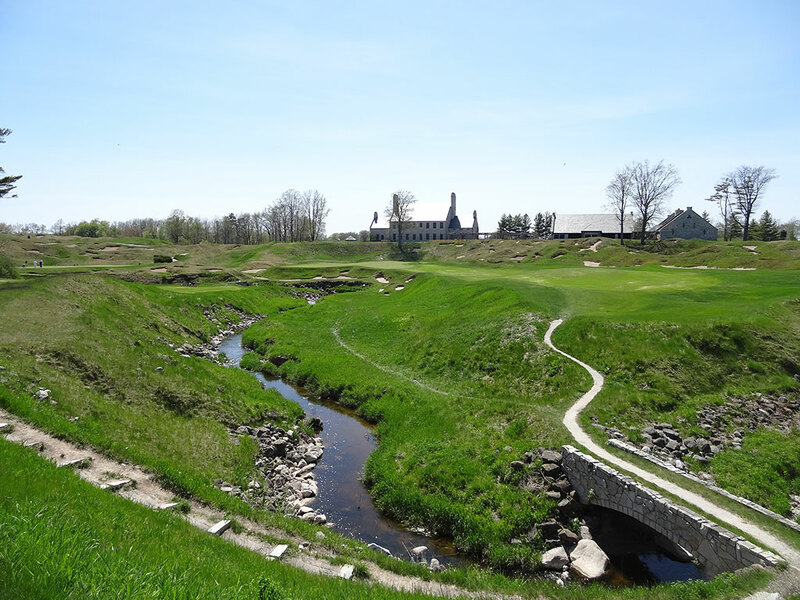 The left side is built up with a substantial hill that is covered with bunkers while the right side falls off towards Lake Michigan with bunkering often saving balls from the water. The bailout is short of the green or utilizing the hill on the left and hope for the proper kick. 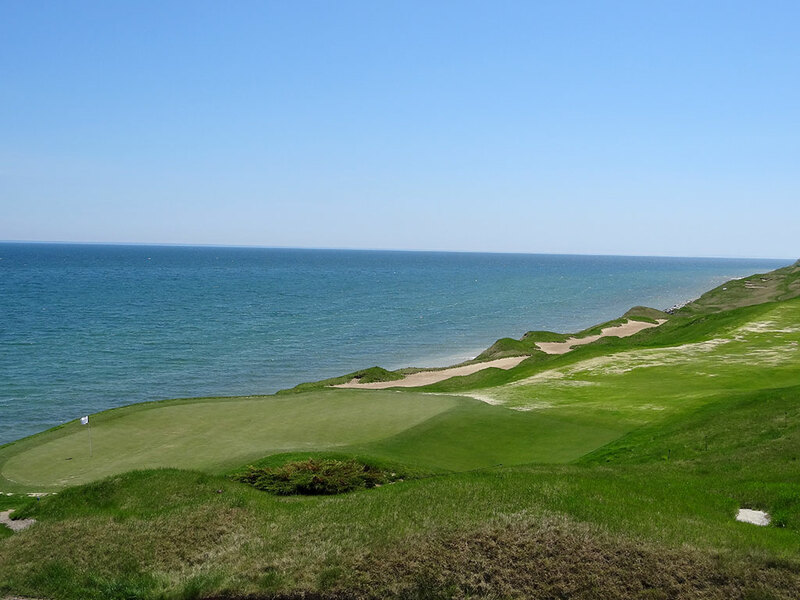 Like all of the par 3s at Whisting Straits, it is captivating visually with the combination of green sand, white bunkers, and blue water from Lake Michigan. 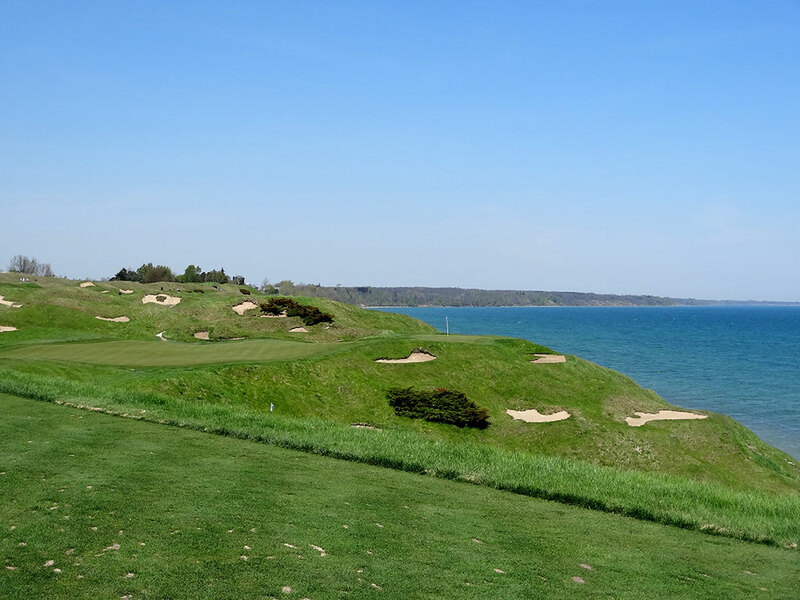 Best Par 4: 13th Hole – 402 Yards – Nicknamed "Cliffhanger" due to the green that sits on an edge over Lake Michigan, this short dogleg right par four is one of the most enjoyable holes on the course to play. Tee shots up the left side will provide the best angle for the downhill approach to a well bunkered green. 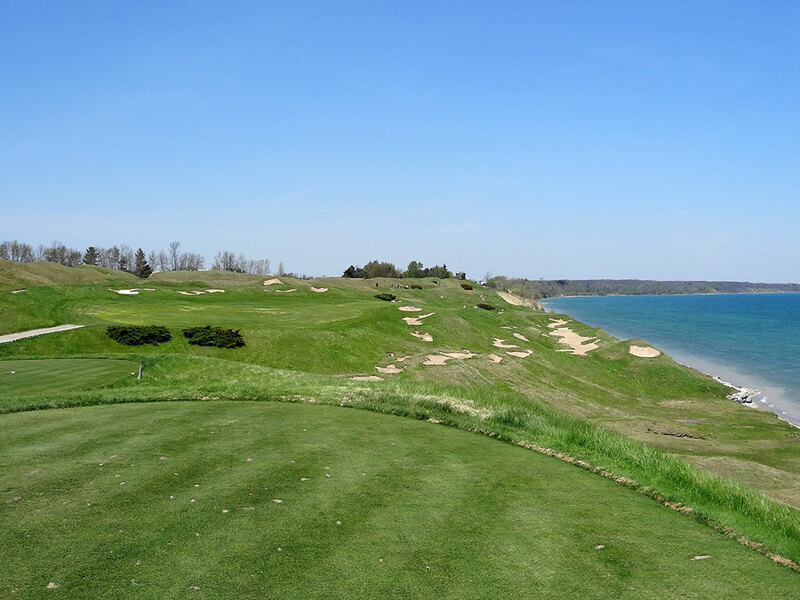 Tee shots or approach shots that leak right will likely find the sand; either in a bunker or on the shores of Lake Michigan where you can kiss par and your Pro V1 goodbye. 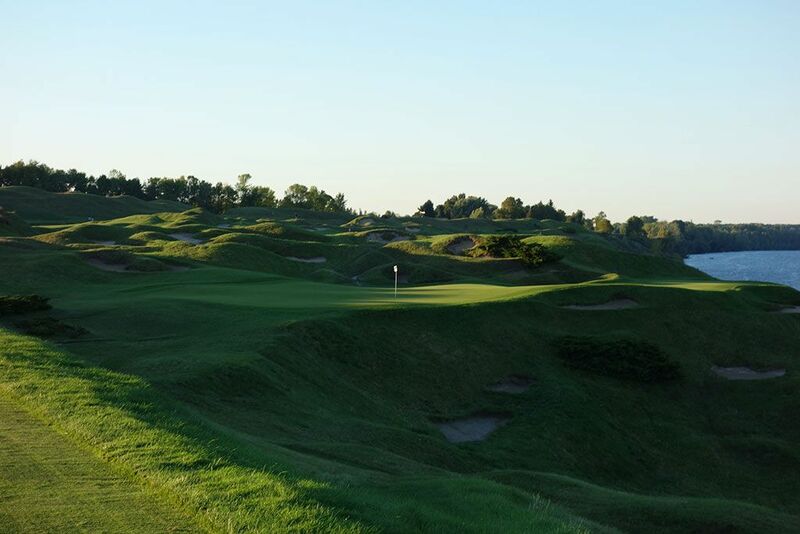 Best Par 5: 11th Hole – 645 Yards – Appropriately named "Sand Box" partially due to the total amount of sand on the hole and largely due to the huge 16 foot deep bunker 100 yards from the green, the 11th hole provides an excellent challenge and unique design. The hole turns from left to right but punishes players with a plethora of bunkers and gnarly grass for those that unsuccessfully attempt to cut the corner. The small, elevated green can be challenging to hold as a false front repels approaches coming in slightly short and shots that are a bit long will often work their way into the bunker behind the green. At 645 yards, the only hope of hitting this green in two is with a strong tail wind which is a more common occurrence than not. Birdie Time: 12th Hole – 163 Yard Par 3 – How good are the par 3s at the Straits course? Good enough to be featured three times in this review! The 12th hole features a massive undulated green that should be easy to hit off the tee but can quickly turn to a bogey if you end up in the wrong part of the putting surface. Pins in the front third of the green will yield plenty of birdies due to the short length and large target while the back right pin location isdiabolicall. 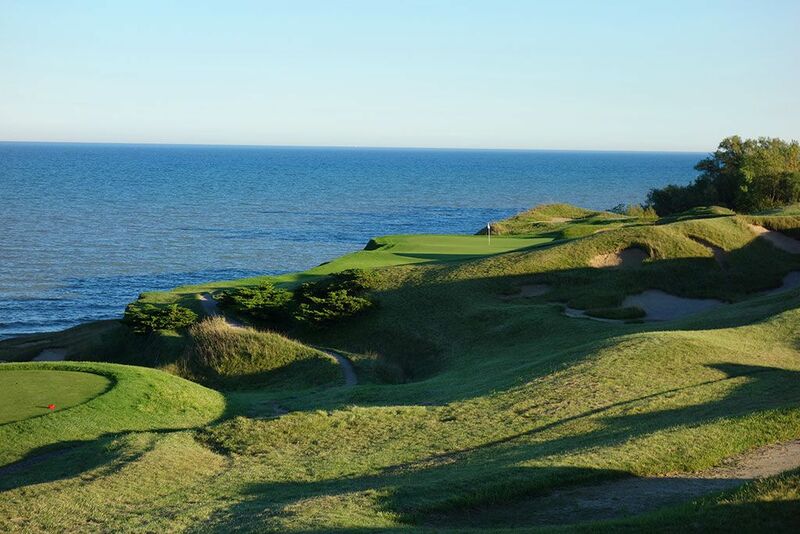 Another beautiful hole running along the coast of Lake Michigan, the 12th hole also has as much character as any on the property. Bogey Beware: 18th Hole – 520 Yard Par 4 – This hole might be one of the most brilliant or one of the most insane holes that Pete Dye has ever come up with and I'll let you be the judge of which one it is. At a punishing 520 yards from the back tee, this hole will yield more than its fair share of bogies and plenty of "others." A creek winds in from the left side of the green and carves a divide in the fairway effectively forcing players to carry it with their approach shot. Players going up the right side of the hole can attack the green in two or hit a layup shot over the creek to a second fairway in an effort to cautiously approach the green. Players that hit their tee shot up the left side can go for the green in two or simply punch a shot up the fairway before chipping over the creek on their 3rd shot. The large green features numerous pin positions that range from tame to devilish. This hole of course is the site of Dustin Johnson's famous two stroke penalty for grounding his club in a bunker which was found right of the fairway. Some of the bunkering in that area has been altered and has effectively eliminated recreating the exact shot DJ faced.